Felix Padel, the great great grandson of Charles Darwin, is a well known Indo-British anthropologist. His book "Sacrificing people - Invasions of a tribal landscape" looks at the colonial roots of the relationships between "Adivasis", the indigenous people in tribal areas of India with the rest of country. "First there were the soldiers, then missionaries and now the mining companies," Padel had said in an interview. His books explore the themes of displacement and the cultural genocide of the adivasis. This post touches on some of the critical issues raised by Felix in his book "Sacrificing People" (Orient Black Swan, new updated paperback edition, 2011). In the preface to the first edition of this book, Felix had written, "My main aim is to understand what has been imposed on tribal people by looking objectively at the various groups of people who have imposed on them." Among the various groups scrutinized critically by Felix are anthropologists themselves, which makes for a very interesting reading. Large parts of the book deal with the issue of human sacrifices among the Konds of Orissa and how the colonial regime dealt with it. Another important area of focus of this book is the meaning of development and how it can lead to exclusion and exploitation of tribal people. Apart from these two areas of enquiry, I personally found two parts of the book very interesting - those dealing with the way anthropologists look at and study the indigenous cultures and the impact of missionary work and religious conversions on tribal lives. The initial works of Felix focused on the Kond group of indigenous people in Orissa. Different sub-groups of Konds such as Konda and Gond are present in neighbouring Chattisgarh, Madhya Pradesh and Andhra Pradesh. During the British colonial rule, Kond groups in Orissa had been the subject of different "reforms" because there were reports of human sacrifice practices among them. Konds sacrificed meriah, children bought from the Dom groups ("lower caste" Hindu groups involved in trading with Konds). Now as in 1830s Konds have close connections with people of an 'untouchable' caste called Doms or Panos, who live in Kond villages and carry on small scale trading .. Other tribal castes whom Konds depend on include blacksmiths, potters and herders, who almost function as sub-castes of Konds. Sundis are a Hindu caste of distillers; they make and sell mahua - the most famous of alcoholic drinks that play such an important part in tribal culture... Konds also have a close relationship with high caste Hindus. Thus, compared to other indigenous groups in Africa or South America, that remained "indigenous" because they were isolated from other people living in their lands, the adivasis-tribals in India, were not completely isolated and had different kinds of interfaces with other population groups. However, in spite of such contacts they were able to conserve their own cultures and customs. At the same time, Felix explains how these adivasi groups assimilated the different influences of other Indian groups such as their caste-based hierarchical relationships with Doms. Thus, on one hand, adivasis are considered inferior by non-advasis and at another level, they themselves considered certain other caste groups to be inferior to them. Culturally they have always been part of Indian civilization, on its edge. Unlike most tribal peoples outside India, they have maintained trading and ritual links with city-based 'civilized' society for well over 2000 years. Ancient texts on statecraft such as the Arthshastra discuss how to win them over as allies... the Indian situation presents a striking contrast to the European or Christian relationship between tribal peoples and 'civilization': in Europe they were mostly conquered, 'pacified' or 'civilized' into peasantry, and converted to Christianity during the Roman period or soon after. Later in the 'New World' tribes were exterminated or at least displaced from their land through a stark confrontation between European colonists and aboriginals. Hindu civilization did not on the whole seek to convert or displace tribals, although there was certainly often conflict, and tribes were forced to retreat to the remotest areas .. This co-existence between tribal and non-tribal groups in India was challenged during the British colonial rule. In post-independence period and especially over the past two decades, policies of liberalization and commercialization with exploitation of natural resources, have put increasing stress on this co-existence. In the book, Felix takes a critical look at the way in which colonial anthropologists had dehumanized the subjects of their studies, where anthropology was a tool of the colonial project and the objective of "civilizing" the tribals translated into controlling them and their resources. He advocates for a transformation towards reflexive or critical anthropology. Felix proposes that our present way of looking at the tribal groups in India is a variation on the colonial attitudes towards them - it supports their exploitation and exclusion from their lands and cultures. In the chapter "Soldiers of Christ", Felix takes a critical look at the role played by colonial missionaries in assisting and expanding the control over the tribals. He briefly touches upon the evolution of missionary activities in the post-independence period. Regarding the missionary role in the colonial cause, Felix looks at the complex relationships between the missionaries and the colonial administrators. Regarding the impact of missionary discourse on the tribal culture, Felix touches on different facets of this issue. Felix notes that after independence, the evangelizing missions have been taken over the Indian Christians and the conversions to Christianity among the tribal groups have increased manifold. Perhaps it would be interesting to see if the Christianity of Indian preachers is in some ways more inclusive of traditional beliefs and ideas of Tribal groups, giving rise to more syncretic versions of the religion? Personally, at one level, I find frightening the idea of homogenising the different cultures and beliefs of people, substituting their rich world of myths and stories, with a common cultural-religious narrative. In recent years, like the missionaries, certain Hinduttva groups have also pushed for some standardized Hindu narratives in which the rich world of Adivasis gets submerged. At another level, the same happens to Adivasi languages, by the dominance of 'superior' languages, mainly English, but sometimes even Hindi or other Indian languages. These discussions raise other questions in my mind - are human societies like museums where we need to keep 'pure and uncontaminated' varieties of people's cultures forcing them to live in the stone age, rather than the natural progressive transformation of societies when they meet other people and other cultures? 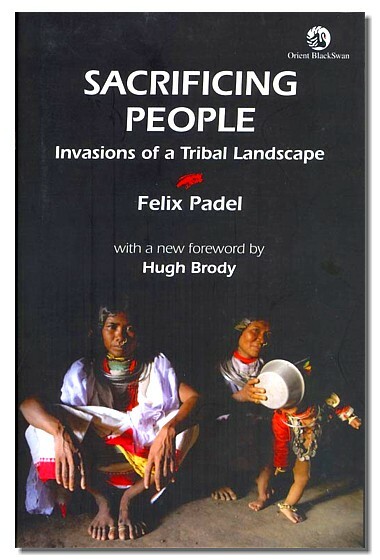 Felix Padel's book "Sacrificing People" forced me to rethink many of my ideas about tribal population groups in India - I think that many of my ideas were/are indeed shaped by the dominant Western cultural discourse which looks at indigenous people as ignorant and backwards and who need to be civilized. Often persons advocating for 'development' get angry by any discussions on the rights of tribal people. They believe that such discussions and related protests against exploitation of natural resources in tribal areas are only ways to block 'progress'. I do agree that sometimes people fighting for rights of indigenous groups have quaint but outlandish ideas about how persons ought to live and about the role of technology in our lives. However, often 'development' is made only at the expense of the poor and marginalized, ignoring their rights and simple human dignity. It may also be controlled by ruthless groups of shareholders who benefit from a corrupt system. How can we avoid the 'development' that destroys our environment for short term gains? In my opinion, finding a middle ground in such a situation is fundamental.